This M806P Full-Semi Automatic is a replica of the famous M14, and the perfect addition for any gun enthusiast or those looking for a perfect practice or target shotgun. This electric powered rifle has a built in quad rail system for adding accessories such as scopes, flashlights, lasers, and bipods. 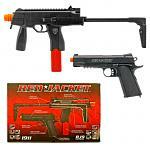 It comes with a high capacity 280 round magazine as well as a rechargeable battery and charger. Designed for competition or practice this assault rifle is built to last through years of use! This is a great rifle for those looking for a reliable weapon that packs a serious punch. Don't forget to stock up on Airsoft Ammo! (L x W x H) 36.38" x 9.25" x 3.50"